Margaret Morton's story is a well-researched summary of a local preservation battle. The story does not mention, however, that the owners' protracted and often absurd actions mangled and twisted County and State laws--to the owners' advantage. That the house was in a state of disrepair is true. That the house was not in that state when the owners first purchased it, and that the owners purposely allowed and aided its deterioration, despite apparently having the resources to prevent its deterioration, is also true. If there were such a thing as fairness, the owners would reimburse the taxpayers for the exceptional burden they placed upon the courts. That will never happen. The owners have systematically destroyed a historic property. Now they are laughing all the way to the bank. Go figger. The long-running fight between the Loudoun County regulators and Milari and Paul Madison, owners of a historic property in Waterford, came to an end today. The building was demolished this morning. More than a year's worth of legal filings ended when Loudoun Circuit Court Judge Thomas D. Horne ruled this week that the county must issue a demolition permit for the property at 40153 Janney Street. 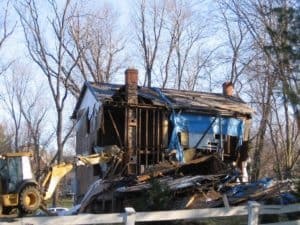 Informed this morning that the house had been razed, County Zoning Administrator Melinda Artman was surprised, indicating that she was unaware that any demolition permit had yet been issued. that any new construction plans submitted by the Madisons must meet all HDRC submission requirements and applicable zoning requirements. The Madisons purchased the home for $180,000 in the summer of 2003. When they bought the house, it was under renovation by previous owners who left the project in midstream after having been issued a Stop Work order for having removed, without permission, the exterior German siding of the building. 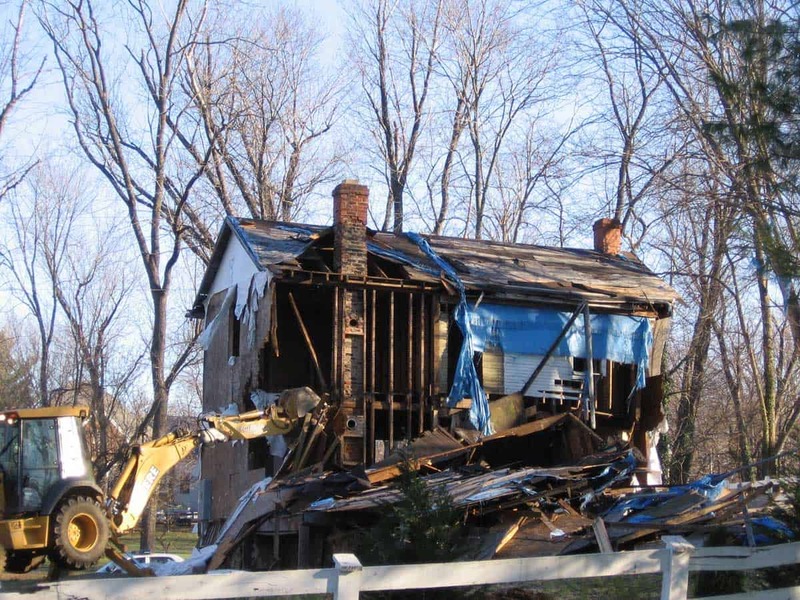 The Madisons' attempts to significantly expand the home failed to gain approval from the HDRC and almost two years of litigation followed, including repeated requests from the Madisons to be able to demolish the house because they claimed it was unsafe. Reaction from the Waterford community to the news that a demolition permit would be issued was a mix of sadness, anger and shock. The 1733 village is one of the county's oldest, which was designated as a National Historic Landmark in 1970 by the Secretary of the Interior. The Waterford Foundation, which promotes preservation of the village's historic structures and its landmark status, has been highlighting the community's rich African-American history, of which Simms' long years of teaching was a part. Neighbors Laura Shaw and Jeff Bean deplored the ruling. The couple has been trying to save Lizzie Simms' home since 1996 in the face of several attempts to either greatly enlarge the simple white frame structure or demolish it. Calling it a "blight on history" for the Simms house to be torn down in a protected historic district, Shaw said if the judge had ruled that the owners had to abide by the county's historic district guidelines and ordered that the Simms House be put up for sale at market value prior to demolition, "a buyer would have been found." Such a provision, she said, if followed, would have at least allowed someone who had the resources and who wanted to try to save the house to be able to do so. Residents claimed that the house was never assessed independently or put up for sale at fair market value; rather it was priced over market. Although several offers, were made to the Madisons, they were not accepted. Shaw's husband, Jeff Bean, said, "We are witnessing the abject failure of our current system regarding the protection of our historic resources," pointing out that there is a loophole in the HDRC guideline that requires a house to be placed on the market for a year before it is demolished. None of that applies if the house is found unsafe, he said. After the county refused to issue a demolition permit, the Madisons took their case to court. Amid the flurry of lawsuits was one in which the Madisons challenged the establishment of the Waterford historic district and its regulations. In the long arbitration process, during which the county and the Madisons agreed to Horne's determination that a binding settlement should be arrived at on all outstanding legal issues, the residents of the town were shut out of the process, according to several. "They could no longer participate in that arena," Shaw said. Instead, they watched as the building deteriorated. In November 2003 it was safely enclosed in Tyvek, with the door firmly boarded up with plywood. It was "demolition by nature," said one resident as over the months the rain and winds played havoc, tearing the Tyvek and entering the building through several apertures, including door and window openings. Although county officials cited the Madisons for not keeping the building sound and protected, they were unable to enforce that provision. Another neighbor, Michelle Dunne, said she was disappointed by the court ruling. Although she said county officials did their best under the current code and zoning ordinances," Dunne said she was frustrated by the way the case played out in the county's legal system. "If the law permits you to do harm to yourself and your own community and then to choose your own remedy, that's wrong. It's an abrogation and needs to be corrected," she said. Most of all, residents said, they were appalled by the precedent the judge's ruling appeared to set and angered by what they saw as the county's decision to end possibly years of litigation by jettisoning Lizzie Simms' house. John Kornacki, recently arrived executive director of the Waterford Foundation, said future efforts must look to strengthen the laws that protect the county's historic resources. "We must examine the processes that yielded such a sad result ... and seek ways of correcting ambiguities in the county's codes, laws and enforcement mechanisms that leave preservation efforts so vulnerable to litigious opponents of those efforts," he said. The Madisons could not be reached for comment.